The magazine receives many great applications for its annual Marina of the Year awards, and it’s difficult to choose only two each year. To help recognize more great facilities each year, MDA started new category awards for 2018. 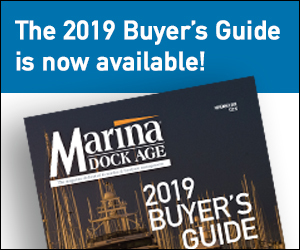 Each of the different awards are based on the Marina of the Year application categories, and the categories for the awards may change each year, depending on the applicant pool and what each business accomplishes that year. 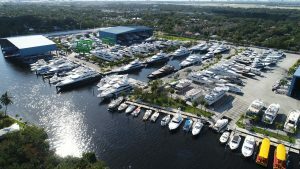 Former Marina of the Year winners are eligible to win category awards, and all facilities are eligible for category awards each year. Congratulations to our four additional winners this year. They were honored on December 5 at The Docks Expo in Nashville. 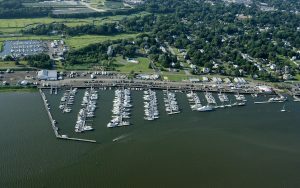 Read more about these marinas in future issues. Legendary Marina in Destin, Florida, received the 2018 Innovative Business Award. Legendary Marina in Destin, Florida, employs many innovative practices to retain employees, attract customers and provide quality service. The drystack facility’s unique operations include an on-site employee training center where mandatory customer service and conflict resolution courses are held, along with CPR, First Aid and more. The facility uses BoatCloud to streamline boat launches and retrievals, and has undertaken many upgrades to its facilities to meet the current market. 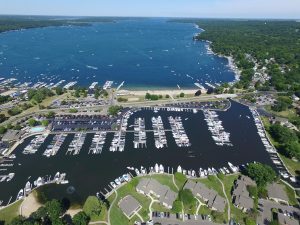 Cedar Island Marina in Clinton, Connecticut, took its stewardship a giant step forward with a solar panel installation in 2017. The marina also practices fish composting and in 1999, it won an EPA award for inventing docks that can be used to grow oysters. The marina is also a research lab and summer camp, supporting marine studies by local scientists, students and professionals. 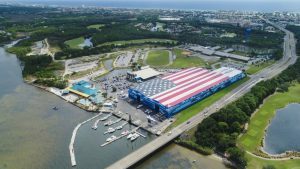 Lauderdale Marine Center in Fort Lauderdale, Florida, received the 2018 Hospitality Award. Lauderdale Marine Center in Fort Lauderdale, Florida, has a customized customer service training for its employees in cooperation with a local college. LMC’s marketplace models allows boaters to bring in independent contractors to do service work, and it manages the contractors/customer experience with innovative practices and with the help of a contractor advisory board and a twice monthly internal survey. The boatyard has also been active in supporting the local industry on workforce development issues, and fundraising for Hurricane Irma victims. Abbey Marina in Fontana, Wisconsin, received the 2018 Building and Growing Award. In the fall of 2017, Abbey Marina in Fontana, Wisconsin, completed a major renovation to replace old structures and add amenities and infrastructure that would help generate new customers and profits. Renovations have been ongoing since 2008, including a new bar area, a new 54- by 30-foot outdoor deck and Harbor House renovation. A major step in 2017 included all new docks and upgraded electrical and water systems. In 2018, the marina added the Commodore’s Corner, an outdoor bar with restrooms. Next up the marina has its sights set on a pool renovation for 2019.